I have more than just a homemade shake and bake recipe from scratch, check out more homemade recipes at the end of the page. This recipe produces succulent and moist chicken, pork and fish. You may personalize these recipes to suite your taste. 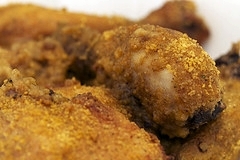 This is my pork chop, fish and chicken basic coating recipe. If you have more then a couple chops or chicken double the recipe. Save money today by making your own coating mix. Mix all ingredients in a resealable bag. Add the fish, pork or chicken in the bag after dipping the pieces in an egg and milk mixture. "Shake it." Place in a shallow pan and "bake it." This recipe will coat 6 pounds of meat. Store mix in an airtight container. This recipe is going to save you major money and calories. Calories? Yes, because the chicken tastes like it was fried - but you baked it. Now that you have the Shake and Bake recipe, I've included the easy steps on how to bake with it. For this recipe, you need to add 1/4 tsp of tarragon to the above recipe. Place seasoning in a large resealable bag and add chicken parts in a bag and shake until well coated. Place chicken in a 9x13 inch baking dish (or baking sheet) in the preheated oven. Place chicken in the baking dish skin side down and bake for 20 minutes. Turn pieces and bake another 20 minutes until tender and juices run clear.